average for any day on a bike of below 10mph! with Rob - the final hill he crested first his only one of the trip! which has a surprisingly good menu. No chance but then that's what Rob said five years ago. At JO'G - but annoyed to find no photographer at the official signpost. Really tough day although only about 55 miles into a constand wind. Now having lunch after a VERY, VERY windy ride from the last stop. 900 miles up ... Just the 16.8 miles to go. Wind is relentless. Two cakes and a coffee later i'm in another bus shelter. Now half way for the day a few miles short of Wick where it's going to be an early lunch. Hopefully some shelter as we continue north. Wind strength unbelievable - had to pedal down hill and was still below 10mph! Just had a huge descent at over 44mph followed by a huge climb at 5mph. Waiting for Rob in the first bus shelter I've seen. Had to put on waterproof trousers to try to keep warm. Had to remind myself a few times why I'm doing this and that the bowel cancer patients will endure much more. At about 55 miles from JO'G Helmsdale is a good overnight place for first/last night of the E2E ride. * we're not staying there, but would have if we had known about it. At Helmsdale with an early finish at 1540 after about 57 miles into the wind with very little shelter. on their JOGLE ... using the Rob & Joe's JOGLE route (Journal 176, map on a CD is available for a donation to Macmillan)- they had a TAILWIND making it easy!! Just over 50 miles for us to do tomorrow. In Golspie for lunch - it's 1245 but no signal so sent later - another bacon & brie baguette! Still the relentless headwind. :-( ..but glorious sunshine. We thought today would be a nice, easy pootle of 56 miles. However, a fierce headwind made life much tougher. Still averaged over 12 mph though. More gorse, foxgloves, Scottish bluebells (we didn't go in and out of them), oystercatchers and jackdaws. Loads of tourist coaches and Scottish Energy vans a big and very dead red deer. 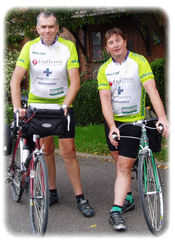 Met two endtoenders -see Rob's entry - luckily for them they had a tailwind. Saw first sign since Land's End for John O'Groats: nearly there!